The next meeting of the Society takes place on Thursday 13th March at 7:30 pm in St. Andrew’s Church, Bilston Street, Sedgley. The speaker is Keith Hodgkins vice chairman of Tipton Civic Society and passionate Black Country heritage campaigner. Keith’s archive photographs of Dudley show the town from the 1900s to the 1970s. In 1939 the small Worcestershire County Borough, surrounded by Staffordshire, covered 4,067 acres, only 200 more than Sedgley Urban District. However, the population of 62,100 was three times Sedgley’s. The evening is an ideal opportunity to view the changing fortunes of the self-styled ‘Capital of the Black Country’, with its C11th castle, medieval market place, Zoological Gardens (opened in 1937) and once vibrant C20th shops. The evening is sponsored by the Sedgley office of estate agents Taylors. They have five other offices serving the Black Country. 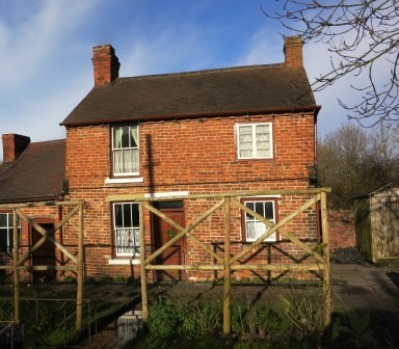 This C19th cottage was first built in one of the Sedgley Manor villages. We told you it was a moving story. The 1840s cottage originally stood in Cooper’s Bank Road, Lower Gornal. Coal mining had distorted the walls requiring external tie rods to be fixed to prevent collapse. In the late 1980s it was dismantled, transferred to the Black Country Living Museum and painstakingly reconstructed. Now furnished as a 1910s home it is known as the ‘tilted cottage’, Jerushah, named after the widow of owner Jack Bradley. She lived there until 1984.